Please Note: This book is not geared to beginners. If you are a beginner, you should start with Totally Tangled . Of course, you can always get both. 🙂 Or better still, support this site and get a copy of the instant download PDF, TanglePatterns BEGINNER’S GUIDE TO ZENTANGLE. Thank you for the review! I SO want this book! I ordered it but shipment is delayed here…so I am (not so) patiently waiting. Good news is that if you have yours it may be released here soon too. I received Totally Tangled this week and it is fantastic! P.S. I noticed in Totally Tangled, page 5, in the box at the top there is a drawing of the cover of her newest book Yoga for the Brain…I am wondering if I have a revised version of Totally Tangled or did Sandy already have this book on the back burner when she published Totally Tangled. Well spotted! I don’t think Totally Tangled has been revised because my copy from last April also has that image and I hadn’t noticed it before. I don’t know the answer, maybe Sandy will drop in and give us the scoop? Wow! Definitely- well spotted! You should win a prize – Heather, you are the first person to notice that. 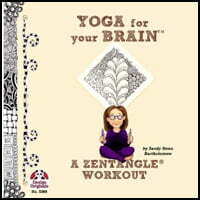 “Yoga for Your Brain” is actually how i have been marketing my Zentangle classes for a couple of years now. I have a trademark on the name and the image. The picture in Totally Tangled is actually the front of my business card which I include in all my box kits for classes. For the new book, I had to change the type around so that the title is at the top. When I designed Totally Tangled, I did NOT know that I would be doing a second book, or what the title would be. life is funny, eh? Cheers! Sandy, cool! I have MS, only recently diagnosed but I have had it for 28 years. I think I would have bought a book titled “Yoga for Your Brain” even if I hadn’t been introduced to Zentangle a few months ago! I find tangling has been therapeutic–very good for my brain, memory, focus, eye/hand coordination, small motor skills and general relaxation. Yoga for the Brain is a GREAT slogan for your Zentangle classes. I ordered Totally Tangled last week, but it hasn’t arrived yet. Hopefully Wednesday. I am curios though, Yoga for the Brain was on your website and listed at $39. Now it is being offered for a more reasonable $16.99. I am curious about the sudden drop in price. Also, besides this Amazon and the Zentangles site, are the books available in any bookstore or craft store chain? Hi Webster, there hasn’t been any change in price it has “always” been $16.99. Maybe there was a speck on your spectacles? 😉 I don’t know about bookstores but I’m guessing it will take a good while before any of these new books show up in the chains. I ordered it the day it was announced but am still waiting for Amazon to ship- AAAGonizing! Hey everyone! I just got my boxes of books from the publisher on Monday (a great Valentine’s treat!) And I have spent the past three days filling all the orders from my Etsy site… including a big box sent to a bookstore in the Netherlands. (Ellen, maybe it is near you?) So I am guessing that Amazon probably got its books on Monday as well. And, if you want your local craft stores to carry these books, TELL them! Hope you all get your books soon… and that you LOVE them! Cheers! I just got my copy of “Yoga for Your Brain” and it is everything I thought it would be and more. I have slowly gone through it a couple of times and will take my time reading every bit in the next week or so. There is so much to see and learn on every page. The detailed tips on the finer points that really take tangling to the next level are wonderful. I also especially liked the journaling and mind-mapping tips and drawings. Thanks, Sandy, so much for a wonderful book! I am interested in the book posted on this site….Yoga for your Brain. However, I’m sure it’s not $147.00. Is there some other place it could be ordered from? Hi Vikki, Yoga For Your Brain is in the process of being reprinted and it’s taking longer than anyone would like. Hang in there for another week or two and it will be available at a rational price. I bought Yoga For Your Brain from my local art supply store, Texas Art Supply, and it’s a terrific book. I have started a whole notebook just to do tangles from that book! I love how the patterns build to more and more complexity from simple steps! I am amazed at what some of the patterns come out like; they make me feel I am not hopeless at drawing! And you can use them so many ways; I haven’t come to the end of them yet and I am sure I have not thought of a fraction of what is possible. I just had to let you know how enjoyable this book is and how helpful to someone who has not been tangling long and was looking for new ways to make them look more . . . dimensional. You book certainly fills that need and much more. THanks for making such a lovely friendly helpful book! I’m in Sandy, I’ve sent you an email to work it out! I have 2 zentangle book and can see adding lots more to my library. I find, however, that the books don’t stay open to pages or lay flat–quite annoying when they flip shut at the most inappropriate moment! Has anyone ever had a book spiral-bound? If so, to what success?